Editor’s Note: This article originally ran in the January 2017 issue of our sister publication MASONRY Magazine. The use of technology in architecture and even on construction jobsites is sky-rocketing, this story emphasizes the benefits of using drones. We hope you enjoy this story as much the readers of MASONRY did. As one of the oldest trades, masonry is known for its rich history, passionate workers, and beautiful long-lasting structures. However, the industry is currently trying to develop new ways to reinvigorate the profession while dealing with an aging workforce. While not a fix-all for the challenges mason contractors are facing, one new piece of technology could potentially change the game when it comes to attracting younger people while at the same time extending the longevity of current masonry professionals. Drones aren’t just for kids and amateur photographers anymore; they’re quickly making their way into masonry. This innovative technology does have a few drawbacks but also has the potential to revolutionize aspects of the way mason contractors do their jobs. For those who may not know, drones are unmanned aerial vehicles that have historically been used for military applications. More recently, consumer drones have come onto the market and along with a smaller size, feature high-definition cameras to capture still and video footage while in the air. Though they initially came on the scene in a more recreational application, some industry professionals have started to use them in their companies. One such individual is Tom Vacala of Restore Masonry LLC, who used a drone to assist in the successful completion of the company’s Lane Tech College Prep High School masonry restoration in Chicago. With over 200 masons and two project managers on the job, this was a large endeavor spanning across a historic structure, so room for error was small. Compounding the size of the project was a goal to finish all the work prior to the start of the subsequent school year. Initially, Tom had used a handheld GoPro camera and climbed the job site around the school in order to get some footage. However, that soon proved to be cumbersome and didn’t allow for a total look at all the aspects of the work being done. Additionally, it increased the amount of time and liability for potential engineers having to get a look and calculate the amount of material needed. It was clear that Restore Masonry needed to take a different approach to this project. So Tom went out and looked into purchasing a drone that could hold his handheld camera and do a flyover of the campus. Immediately, the owner of the store steered him in another direction­– a drone with a camera built in. Despite concerns, Tom was reassured that the video quality and ease of use would allow him to accomplish what he set out to do. While combatting an aging workforce with the use of drones saves on liability, Tom also found that it saved on time. Using building plans and photos combined with the drone, Restore Masonry was able to quickly see brick size and calculate the amount of material needed. Tom Vacala of Restore Masonry isn’t the only industry professional that has turned to the use of drones in making the job safer and more efficient. Joe Bonifate, President of Operations at Arch Masonry out of Pittsburgh, also weighed in on their use of drones. Their model, the DJI Phantom 4, can maintain focus on a certain person or object and autopilot itself to keep things in focus. Arch, like Tyler Lane, has also incorporated the use of drones into the bidding process. Additionally, Joe notes that the drones frequently are able to capture photos that would otherwise require a helicopter, which in most cases is not a feasible option for smaller contractors. Further, Arch Masonry has noted that the bird’s eye view of the jobsite allows them to point out any logistical or staging issues. Tom Vacala echoes the effect on work efficiency and safety. Though not the original intent of the drone, he has found that it does increase the effectiveness of his teams. Many potential drone users may be concerned about the regulations. However, relatively quickly, Tom was able to get the drone up and flying around the project in no time. As of August 29, 2016, well after Tyler Lane’s Lane Tech project, the FAA has implemented new regulations regarding the use of “unmanned aerial systems.” As part of the regulations, the Administration has implemented a new certification process for drone users. The basic components for one to become a certified drone pilot are to: pass a knowledge exam at an FAA-approved testing center, go through a vetting process with the TSA, get a Remote Pilot Certificate with a small UAS rating, allowe drone to be inspected if necessary, and report any incidents of injury and/or property damage over $500 within 10 days, take a subsequent aeronautical examination every 2 years, and regularly inspect the drone prior to flying. According to Joe Bonifate, the process was fairly simple and one of the company’s estimators took the test at a nearby airport. There are some challenges to using a drone for masonry projects, though. Rain, high winds, and radio interference are all issues that can interfere with the scheduling and actual flying of drones on a job site. A big challenge, at least for Tom in Chicago, has proven to be the weather. While using the drone as part of the bidding process on another project, the plan didn’t go quite as intended. Joe of Arch Masonry, similarly, had an issue with the drone that resulted in a costly repair. After heavy radio disturbance got in the way of the drone’s signal with the controller, it lost its bearings and crashed. The repair was not covered under warranty and wound up costing hundreds of dollars. After a costly repair, both Tom and Joe respectively purchased second drones. As the technology is still relatively new, drone manufacturers are consistently trying to improve on the reliability and durability of the devices. 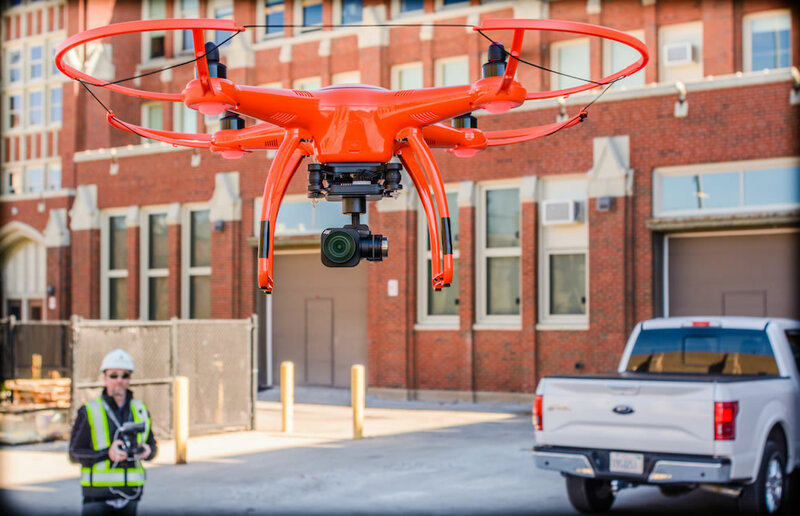 So, after hearing about how a drone has made life (for the most part) easier and more effective for two masonry companies, you may be asking yourself where to get started on your search for the perfect drone. Price, features, ease of use, and reliability are all options to consider when looking for a unit to implement in your business. It should be noted that many drones are intended for recreational use, so the durability, flight time, video quality and technical support may be much more limited. For mason contractors, any detail work will require an HD camera, and a flight time of at least 10-12 minutes (likely more). Propeller guards, replaceable batteries, and rugged carrying cases are all options that most drone makers manufacture. A solid drone that can be used for projects will run from $399 all the way to about $3,500. Camera quality, flight time, quality and build materials are all elements that can drive the price higher. For Restore Masonry LLC, Tom’s first drone was a Yuneec Q500, which has since been replaced with a newer model. It did not feature propeller guards or a 4K camera, but still did capture high-definition footage that was able to capture the details of the restoration work. There were issues after the crash, when Yuneec repaired the drone incorrectly and it had to be sent back again. His second drone is from Autel Robotics, and is equipped with propeller guards and a 4k camera, making it a step above the first generation drone. Additionally, Autel sells “The Rugged Bundle” for industry professionals, which comes with additional replaceable batteries that extend flight time to over an hour and a half. For Arch Masonry, a DJI Phantom 4 was their drone of choice. With a 3.1-mile range and 28 minutes of flight time, the drone is a powerhouse and the choice for many in the construction industry. It provides an HD camera that can actually focus on and follow a moving subject. There are options that take things even higher than the drones Tom and Joe have been using. Kespry, a company that strictly constructs commercial drones, has some unique features but can run upwards of $30,000 per year when paired with the Kespry Cloud service. However, the drone does something most other competitors don’t: it can provide high-density 3D models of what it’s flying over. It also automatically syncs with the cloud for immediate access to the data being recorded, as opposed to having to continually manage storage on an SD card and a computer. As you can see, drone technology is a promising new development in the field of masonry. Combined with the workforce development efforts (many of which you will see in upcoming issues of the magazine), this modernization of the masonry process could potentially extend the productivity of an aging workforce. Though they currently have their drawbacks, drones can provide contractors of any size with a unique way to do business. Watch the Drones Spotlight Video of the month!